Step 2 Saute the onion and garlic in tallow, until translucent. Place 1/2 the onion/garlic mixture in a large mixing bowl and the other half in the smallest bowl of your food processor. Step 3 In that same large mixing bowl that you just added the onion and garlic to, add and mix together the chorizo, ground beef, eggs, adobo sauce and almond flour. Your hands will do the best job of incorporating the mixture, so don’t even bother trying with a utensil. Get out 2 normal sized muffin tins. Dollop the meatloaf mixture into the muffin tins, filling them up about 3/4 of the way. If you fill them to the brim, the rendered fat will spill over and make a terrible mess in your oven. Place the tins in the oven and bake until you see rendered fat in each muffin tin, along with a slightly browned, crusty bottom on each loaf, about 25 minutes. Step 5 To the saute pan, add the tomatoes. Let them cook until the skin starts to blister and blacken and you see them pop open. Add the tomatoes, along with the chipotle pepper, olive oil and some salt to the food processor (Where the onions and garlic have been patiently waiting for you.) and pulse until a nice saucy consistency forms. If the sauce is too wet for your liking, you can pour the contents into the saute pan and let it simmer down until some of the liquid has evaporated. Stir in the cilantro. 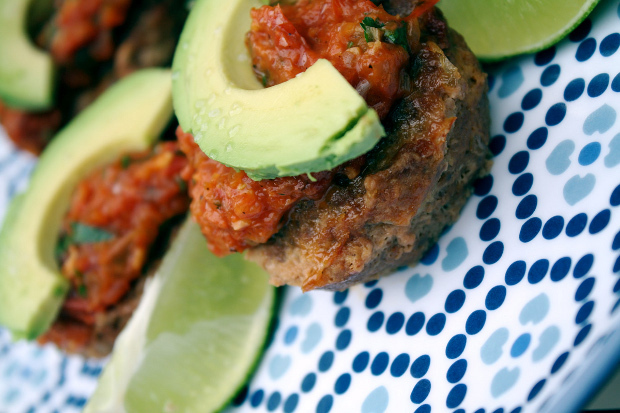 Step 6 Garnish the meatloaves with a spoonful of relish, sliced avocado, a pinch of salt and a squeeze of fresh lime. Shake up the traditional meatloaf ingredients a little bit, and you’ve got a weeknight meal that packs great flavor and is ready to hit the table in less than an hour.